• Do a mobile recharge/bill payment on Amazon and get Rs. 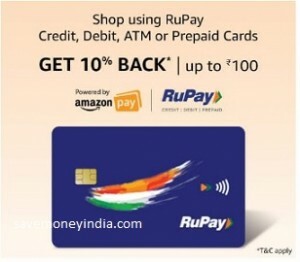 100 cashback on purchase of Rs. 1000 on Amazon Fashion. After the recharge/bill payment, customers will receive an email or SMS with this offer. Customers who have collected the offer will get a cashback of Rs. 100 on min purchase of Rs. 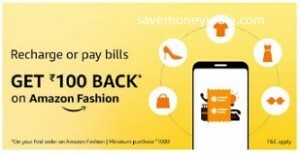 1000, applicable once per user on paying using any digital payment methods (Credit / Debit Card/ Netbanking/ Amazon Pay Balance/ BHIM UPI) for a product purchase on Amazon Fashion (except gold & silver coins) on Amazon. • There is no minimum order value for recharge or bill payment. However, after doing the recharge/bill payment, yes, there is a minimum order value of Rs. 1000 required to be eligible to avail the cashback. • You can get the cashback only once during the offer period. • Cashback will be credited as Amazon Pay balance within 3 business days of the Amazon Fashion order date. • Offer Period: 12:00 pm April 18, 2019 to 11:59pm April 30, 2019.